Plymouth Rock Comes To Life! If Plymouth Rock could talk, what would it say? 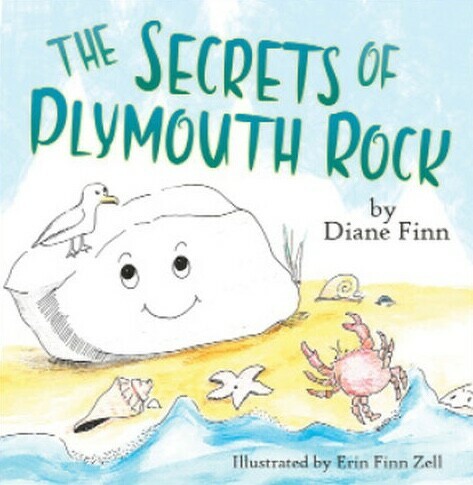 In the children’s storybook “The Secrets of Plymouth Rock” the rock indeed talks. It tells the story of the Landing of the Pilgrims. Most importantly young audiences in Plymouth Massachusetts are learning not only does the Rock talk, it sings! Singer/Songwriter Candido Bretto takes students on a rockin’ musical journey from cover-to-cover of the book with 12 original songs. The Rock sings about hope, optimism, survival and self awareness. Author Diane L. Finn a Plymouth elementary school teacher of 30+ years wrote a curriculum with the Plimoth Plantation to teach about the Pilgrims. “I wrote the book as a way to teach young children on our tours when they visited Plymouth Rock.” Diane was referring to “Colonial Lantern Tours” which she owned and operated along with her husband Dan for many years along with the Plymouth Rock Trolley Company in Plymouth. 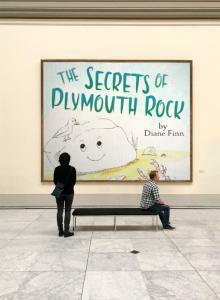 The quickest way to get a copy of Diane’s book is to visit her website at TheSecretsOfPlymouthRock.com. If you’d like to purchase the companion music cd your wait will be over this summer. On Saturday, May 4th and Saturday, May 11th, 4th and 5th grade students from 6 Plymouth area elementary schools (Cold Spring Elementary School, Nathaniel Morton Elementary School, West Elementary School, South Elementary School, Federal Furnace Elementary School and Hedge Elementary School) will be singing the songs in the Funk Lab recording studio owned by actor Johnny Drama Alves of tv’s Wahlburgers. Stay tuned. If that’s not enough, wait until you hear what dancer Kaylee “Impavido” Millis of tv’s “So You Think You Can Dance” has planned for Plymouth area students. She’s choreographing the music and plans to teach “Rockin’ The Secrets of Plymouth Rock” this summer. Once again, stay tuned. Gee, if we only had a scriptwriter we could turn this into a play. Guess what…we do and he did! Introducing scriptwriter Tyler Ferreira from Duxbury, Massachusetts. Tyler was very successful out in Hollywood at scriptwriting and has written a wonderful script for the story and music. With the 400th Anniversary of the Landing of the Pilgrims around the corner this is the perfect way for elementary aged students around the US to celebrate the birth of our nation along with the students of Plymouth MA. The themes of the 400th celebration are innovation, exploration, self-governance, religious expression, immigration and thanksgiving. “Rockin’ The Secrets of Plymouth Rock” touches upon each one in its unique way teaching our children Early American history through music.